At Fortress Armored Services, we understand how challenging cash processing can be for your business. 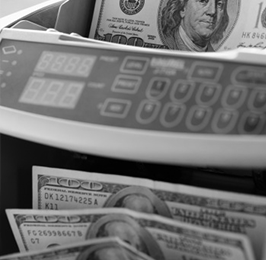 Fortress Armored has specially trained staff to handle large volumes of cash, and technologically advanced equipment to ensure cash processing speed and accuracy. We provide the facilities, management expertise, software and hardware for counting, transporting and storing your cash. You will receive daily reconciliation of your inventory sent directly to you through encrypted transmissions. Business owners and managers usually spend too much valuable time overlooking every step of their cash handling services and cash logistics process. This traditional way is inefficient, seemingly endless and expensive. Understanding this gap in the marketplace led us to develop our innovative cash management solution. That’s the Fortress Cash Processing advantage. Instead of your managers spending valuable time managing your cash, Fortress cash management services provides an end-to-end solution so your team can stay focused on growth, and less time in cash management. This affords you more control over your money, security, and time. As the premier cash management and logistics firm in Southern California, we take pride in being the local, responsive solution for our clients’ cash management needs.